A New Way to Die: What Happens to Supermassive Stars? Authors: Ke-Jung Chen, A. Heger, S. E. Woosley, A. Almgreen, D. J. Whalen, and Jarrett L.
We have known for some time now that supermassive black holes (SMBHs) live at the center of most massive, elliptical galaxies. However, we do not yet know exactly when or how these beasts (I’m talking a billion solar masses, or maybe even bigger) form. 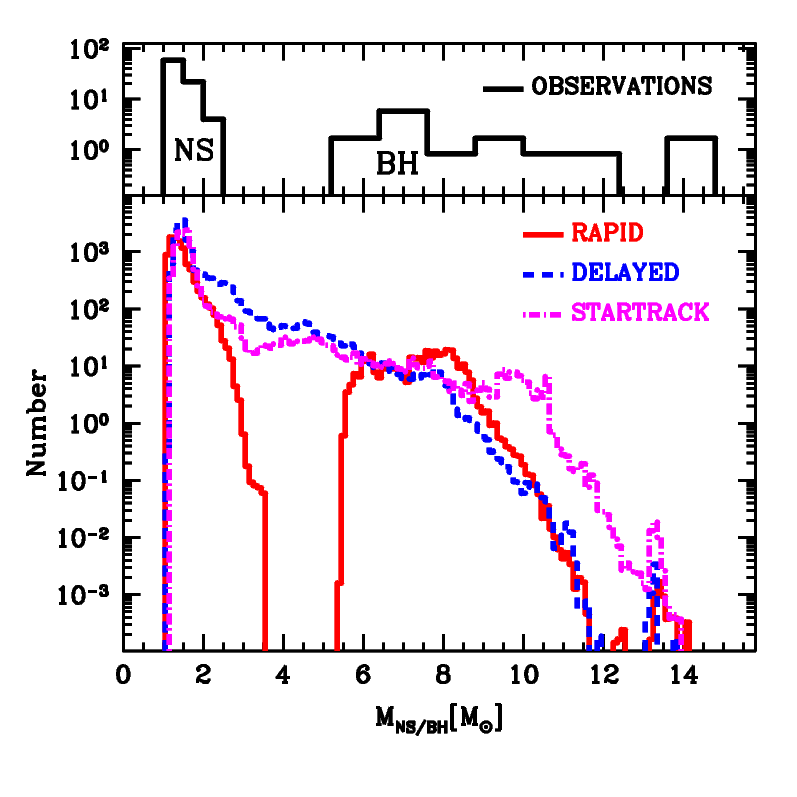 The earliest observed SMBHs are seen at a redshift of ~7, corresponding to a billion years after the Big Bang and shortly the formation of the first galaxies. Whatever process forms these extreme objects must act astoundingly quickly. SMBHs could begin their life as the dead remains of a Population III star (the first stars of the Universe). However, a black hole formed from a typical Pop. III star of a few hundred times the mass of the sun may have a difficult time growing fast enough. ~100,000 solar mass Supermassive Stars (SMSs) provide an additional avenue for SMBH formation, forming massive seed black holes that grow over time. Detecting these stars, or their signatures, is currently prohibitively difficult as they are too faint and too far for current telescopes. 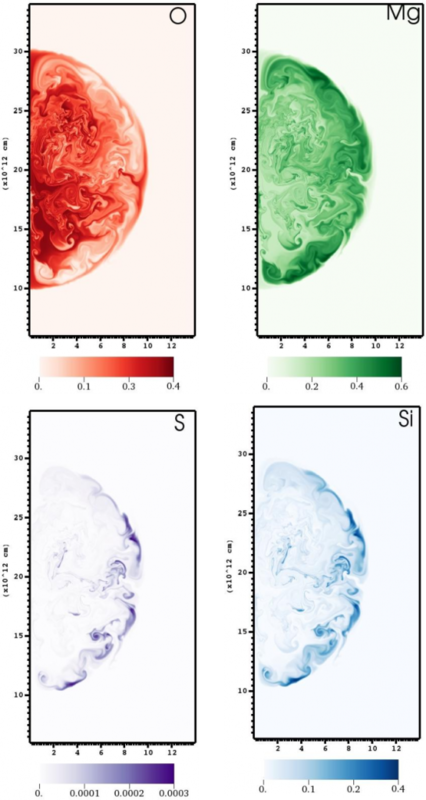 The authors present the results of a simulation of a SMS that, instead of forming a black hole, explodes as a special kind of supernova. This could provide another signature of SMS star formation, pointing to the possibility of their role in SMBH formation. The authors have found a narrow mass window in which a supermassive star explodes completely, instead of forming a black hole. In this work, they model the evolution of a star 55,500 times the mass of our sun, noting that simulations of a slightly larger 56,000 stellar mass star formed a black hole. They use a high resolution, 1D stellar evolution code called KEPLER to model the star’s life that takes into account key stellar evolution processes, including nuclear burning and stellar convection, and relevant for massive stars, photo-disintegration of elements, electron-positron pair production, and special relativistic effects. A final important inclusion is a prescription for general relativistic effects, which become important for stars above a thousand solar masses. This 55,500 solar mass star evolves along the main sequence for 1.69 Myr before it begins to collapse (for comparison, our Sun has a lifetime of around 10 Gyr). Some massive stars, like the few hundred solar mass Pop. III stars, explode into a supernova through a pair-production instability. This occurs when the supporting pressure in the star drops suddenly when nuclei collide with photons, producing electrons and positrons (if you are interested, this chart gives a really nice look at what can happen to Pop. III stars). The simulated SMS, however, becomes unstable due to general relativistic effects. Photons in the center of the star act to add to the gravitational potential of the star, creating an instability and causing a collapse. As the star collapses, it begins to rapidly produce Oxygen, Neon, Magnesium, and Silicon from Helium in its core. This process releases more energy than the binding energy of the star, halting the collapse and causing a massive explosion: a supernova. The death of the star itself is simulated in 2D with a code called CASTRO. As the collapse is reversed, the Rayleigh-Taylor instability mixes the heavy elements produced in the star’s final moments throughout the star itself. Fig. 1 shows the mixing of the heaviest elements produced in the star just before the star explodes completely. Mixing to this level would create a distinct observational signature in spectra of the resulting exploded material. What makes this supernova unique is that it came about through a general relativistic instability, rather than a pair production instability. The authors compare the elements produced in each case, and note that the pair instability supernova can produce enormous amounts of Nickel-56 and other iron-group elements, while this SMS only made very trace amounts. The size of these SMS explosions could possibly enrich its entire host galaxy and even neighboring galaxies with elements from Carbon to Silicon. In some cases, it may even trigger a burst of star formation within its host galaxy, which could make it visually distinct from other young galaxies. The authors conclude by noting that these explosions could be observed by upcoming near infrared observation experiments, or distinguished by their spectral signatures. The authors show that these SMSs can produce over a 100 times more metals by mass than a supernova from a more normal (around 200 solar mass) Population III star. In addition, they would have a unique spectral signature containing a significant amount of carbon and oxygen, but only trace amounts of nickel and iron (unlike a normal Population III star). If this is observed, it could strongly support the idea that these SMSs actually did form in the early Universe, and could give clues as to whether or not they are the source of SMBHs.